Waterfront Park is a 12-acre park, along approximately half a mile of Cooper River in Charleston. As the pineapple symbolizes Southern hospitality, the park's centerpiece is the Pineapple Fountain. We got to do some geocaching in the park as well, but I failed miserably. 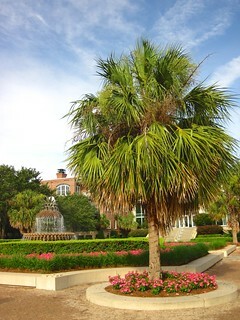 Though South Carolina is nicknamed the Palmetto State, I didn't get many pictures of the palmetto. Naturally, it is the state tree of SC.